“Mama, why do kangaroo's hop? Why don't we run, or walk, or slide on our bellies?” Kip bounced his tail up and down on the red dirt. “Because that's the way crocodiles are. We swim and eat fish.” Cedric slid back under the water. Danny Dingo ran over to the edge of the billabong to have a drink. “Danny, do you hop?” Kip looked at his friend. “Because that's the way dingo's are.” Danny ran off. The bird laughed her head off. “Of course I don't. I could, I suppose, but mostly I fly. I'm a kookaburra and that's what I do.” She flew off, heading for the sandstone rock in the distance. “That's right, Kip. Are you happy about that now?” His mama smiled at him. “I'm happy that I'm a kangaroo and can hop all over the place. I can hop as high as I want. 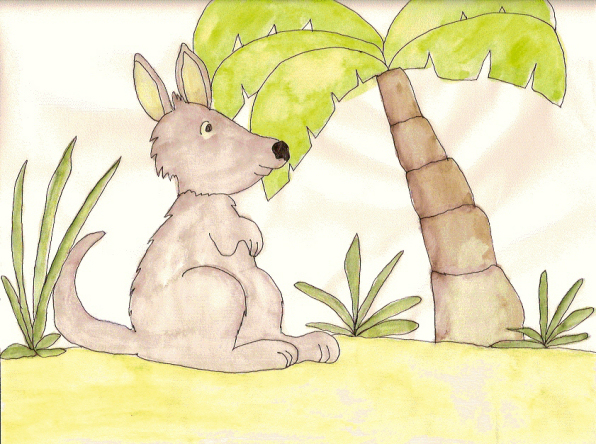 I'm glad.” Kip spent the rest of the day hopping about the bush, enjoying being a simple kangaroo.